Locally, 3,700 pounds of turkey and more than 7,000 pounds of nonperishable items were collected during the two-week drive, which ran from November 2 to 16, with donations from homeowners, vendors and team members. Houston team members donated the items to the organization, which were picked up and distributed to nearly 800 families in time for the holiday. The David Weekley Family Foundation also participated by donating $10,000 to each organization to provide for meals and additional needs of the charities. In Houston, the Thanksgiving Drive benefitted Montgomery County Women’s Center, Houston Area Women’s Center and Mission of Yahweh. These organizations provide a 24-hour hotline, safe shelter, crisis intervention, counseling, advocacy and legal services to survivors of family violence, sexual assault and stalking. 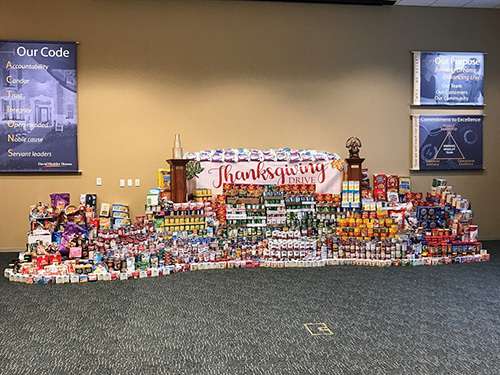 Homeowners, vendors and team members from David Weekley Homes donated more than 10,000 pounds of turkey and nonperishable food items to Montgomery County Women’s Center, Houston Area Women’s Center and Mission of Yahweh to benefit families in need. The Montgomery County Women’s Center has been committed for many years to providing a 24-hour hotline, safe shelter, crisis intervention, counseling, advocacy and legal services to survivors of family violence, sexual assault and stalking. Our mission is to lead the effort in preventing domestic violence and sexual assault through crisis intervention, assistance, advocacy, empowerment and social change. The Mission of Yahweh began with a vision given to Mrs. Helen Gay – known by most as Sister Gay. Today, the Mission Campus consists of 12 buildings, which includes two emergency dormitories and one transitional dorm for both single women and women with children. Sister Gay’s vision continues to drive The Mission’s mission to enrich the lives of homeless women and children.